Mansfield, MA – March 3, 2014 – Continuing a tradition of promoting from within the company, National Lumber has proudly announced the promotion of Brandy Souza to General Manager of Kitchen Views, their cabinetry and design division. Souza will report directly to company President Manny Pina. Brandy began her career interning for Paul Brent, a world renowned seaside architect and artist. After her internship she went to school and worked for a general contractor, Rex Spencer, where she drew plans and managed residential projects. She loves working with materials that remind her of beach vacations, both Miami exciting and Cape Cod relaxing. She draws from her ability to design a kitchen to meet specific needs of her clients and bring their dream kitchen to life. She combines her technical expertise with a fine eye for design and a commitment to customer satisfaction. 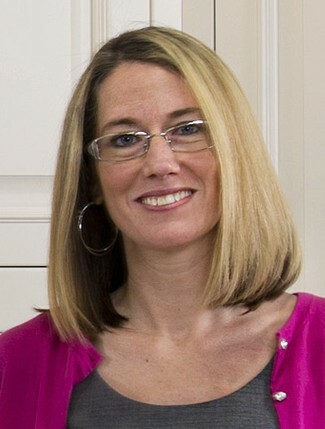 Brandy Souza has been with Kitchen Views since 2005, starting as a designer in National Lumber’s New Bedford location. She has consistently shown strong leadership and a determined attitude to improve every situation with tact and graciousness. Her amazing design acumen is demonstrated in her work creating Kitchen Views’ lovely and comprehensive Warwick showroom. Most recently Brandy designed stunning updates for the flagship Kitchen Views showroom at the Mansfield headquarters. Brandy is expected to continue Kitchen Views’ promise of exceptional customer service, leading by example. Attending Design and Construction Week, the combined 2014 IBS and KBIS show in Las Vegas, Brandy was recently commended by clients for her delightful hospitality and expert guidance through the KBIS portion of the show. A sought after expert for her design and materials expertise, Brandy has been interviewed and quoted in articles for Boston Home Magazine, New England Home Magazine, Rhode Island Monthly’s Annual Home Design issue and others. Brandy enjoys sharing her expertise through articles posted on the Kitchen Views blog. With readers from around the United States, and many followers in England, homeowners are drawn to Kitchen Views for the product knowledge and design insight provided. Her posting on design trends for 2014 was picked up on Twitter by several industry sources. Glass clarity impacts the ambiance of open concept bathroom design, and Kitchen Views strives to bring you the best advice for selecting the materials that make our designs a reality. Kitchen Views only deals with vendors that are the best in the business. 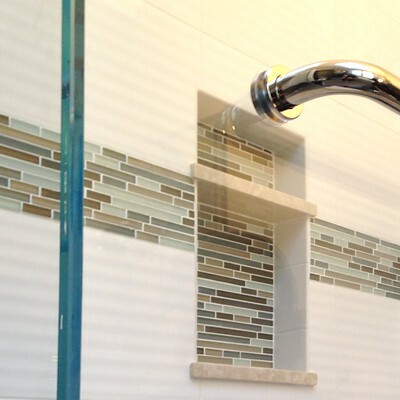 For kitchen or bath glass solutions, we recommend Allstate Glass for their quality products and friendly staff. They are available to answer any questions regarding your project. Just when you thought ALL glass was clear — compare the standard “clear” glass you see almost every day to this low-iron, “Ultra-Clear” glass and you’re in for an ultra-clear surprise. Growing more and more popular, particularly in high-end homes, ultra-clear glass is fabricated by reducing the iron to increase light transmission and reduce the greenish tint in clear glass that is visible when viewed from the edges. 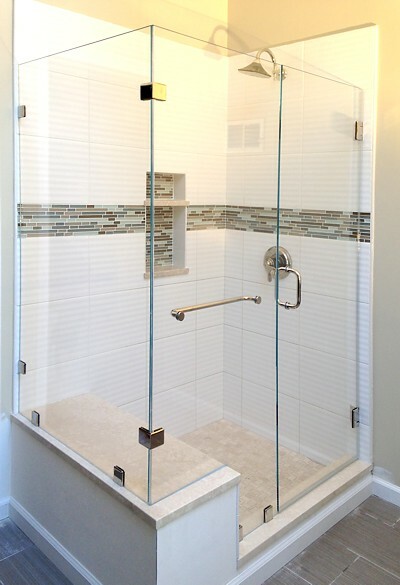 This Canton homeowner loved the idea of maximizing the natural light in his new bathroom with an ultra-clear glass shower enclosure and chrome hardware. Contact Allstate Glass to learn how you can bring more light and clarity into your bathroom with an ultra-clear glass shower or steam enclosure! 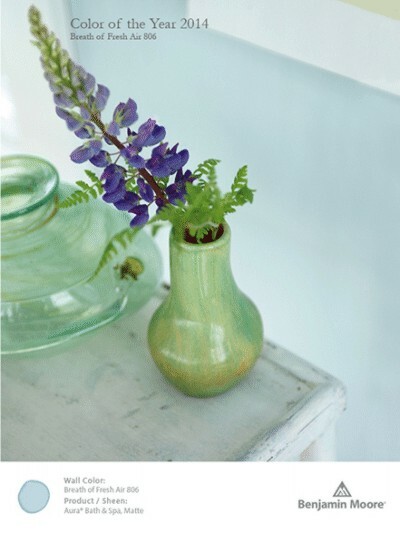 Click here to see our brochure that is available through the Kitchen Views website. Kitchen Design & Home Improvement Go Hand in Hand. Survey results show 55% of consumers plan to do a kitchen remodel. A recent online survey done by remodelormove.com shows that American consumers are feeling more confident in spending money toward home improvement projects. The survey had 5,000 participants who answered a range of approximately 70 questions to determine if the majority would rather move or remodel. Every participant showed interest in making some sort of improvement to their current home. The results show consumers are willing to spend around 30% of their home’s value for the home improvements. With long-term value being a factor in remodeling, homeowners are willing to use more expensive materials in their projects. A majority, 74% responded that they plan to hire a general contractor to do the work, rather than undertaking projects themselves. Along with hiring construction professionals, more than half of the respondents plan to hire an architect. Homeowners are planning their projects on a larger scale and are including multiple rooms, and will be better served having professionals to oversee the project. The percentage of homeowners planning to do a kitchen remodel is right above the halfway mark at 55%. Kitchen remodels are taking precedence over baths, according to the survey, and this is where consumers are willing to invest more of their budget. 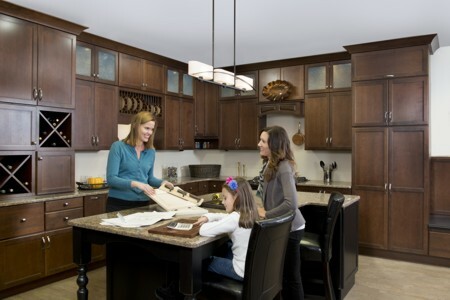 Since the contemporary kitchen is the hub of family activities, this is really an investment in improving family life. Kitchen Views at National Lumber has experienced designers to serve you through every phase of your remodeling projects. We can supply you with the building supplies you need and the services you deserve. Those services include getting to know the unique needs of your family. Your particular tastes and lifestyle are factored into the design. We strive to exceed your expectations. One of our designers will follow the project from concept to completion. Kitchen Views at National Lumber, where the designers are pros and the views are yours! “Where the designers are pros, and the views are yours.” That is our motto here at Kitchen Views. We are here to design for you with integrity and the highest quality products possible. This summer, we hosted an open house style RV showroom displaying counter materials from Cosentino. They drove to Mansfield and parked their RV in our lot and were there to meet with designers, builders, and homeowners about their different product lines. Most recently, the KV designers met with various vendors to see what is trending for 2014. Here are a couple of examples from the evening. 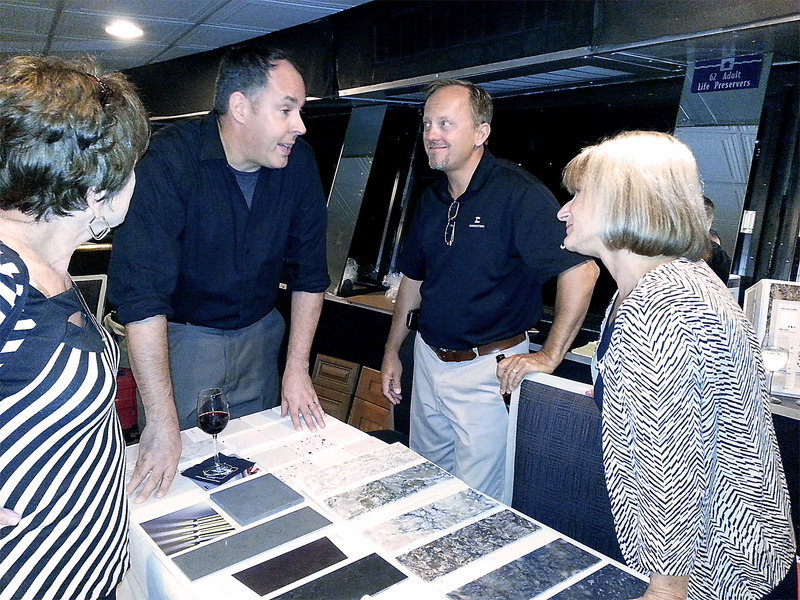 Cabinets – The designers at KV joined cabinet dealers to take a look at new product on the NKBA‘s Boston Harbor Cruise. 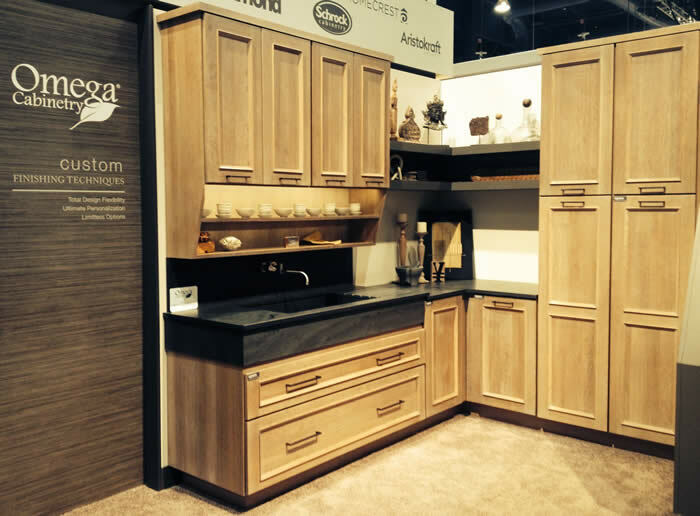 Cabinet vendors showed the designers the new textured doors and rich grays that are available for 2014. Kitchen Views stays ahead of the curve by making sure new product is available to customers right away. Contractors that work with KV enjoy the fact that their customers are getting the most current products on the market. Counters – Countertop material has changed dramatically in the marketplace. New finish processes prevent staining more than ever. The designers tested the new SileStone Suede finish by attempting to scratch and stain it. Each designer took a different approach to test the material to make sure customers were going to be satisfied with overall durability. Some attempted to scratch it with glass, knifes and tile. Others tried to stain it with cherries, red wine and soda. The product performed exceptionally well and KV will be displaying the new product in the Newton store next month. These types of meetings give the designers a real trial of how these products will perform in the field. KV Designers John Allen and Lee Turner converse with Jim and Merry from Cosentino about the quality of their new product line. It is our duty to those we service to research various products and find those that consistently match the quality we expect to deliver to our customers. 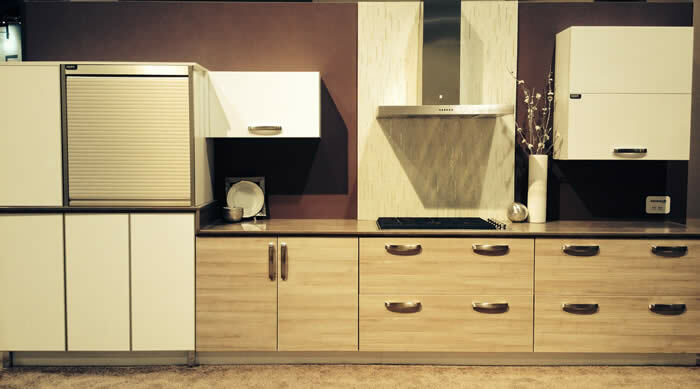 If you would like more information on how our designers can assist you, or if you have questions on the products we carry, feel free to visit or call a Kitchen Views showroom closest to you, or visit our website at kitchenviews.com. We look forward to sharing more about these new features when they are rolled out in February 2013! 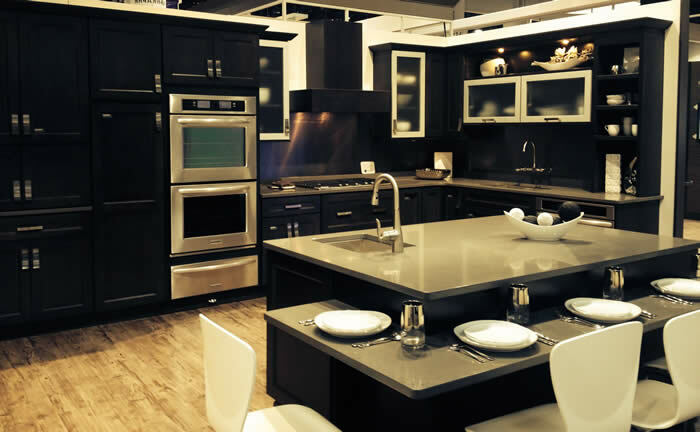 If you’d like to learn more about Schrock Cabinets, contact a Kitchen Views showroom near you!